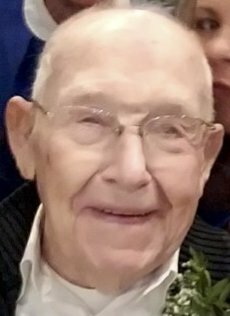 Floyd Sill, a loving father, doting husband and avid fisherman and golfer, passed away surrounded by his family Sunday, Jan. 21, 2018, at his home in Wabasha. He was 89. Floyd was born on February 4, 1928, on the family farm in rural Winnebago County, Iowa. He attended country school near his home and graduated from Thompson High School in 1946. On July 24, 1953, he was united in marriage to Mary Bunkofske at the Ramsey Reformed Church in Titonka, Iowa. They moved throughout Minnesota, Iowa and Wisconsin with Floyd’s work as a lumber yard manager before settling in Wabasha in 1975. Along the way, the couple raised seven children: Carol, Cynthia, Cathy, Rodney, Cheryl, Robert and Richard. Throughout his life, Floyd expressed his love of carpentry by building and remodeling homes for family members. He had a willing heart and was there with a helping hand when his children would call upon him with a need for home improvements. He loved golfing and his early-morning fishing trips, where he would usually catch his daily limit and share with friends and neighbors. 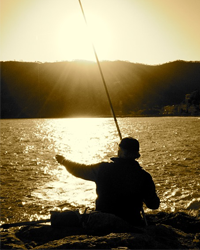 He enjoyed teaching golf and fishing to his children and grandchildren, who now have fishing stories to last a lifetime. He also made sure they would get boat rides each time they came to visit in the summer. After retirement, he added cribbage and coffee with friends to his morning routine. He will be sorely missed for his sense of humor, for his kind, big hearted personality, and his love for people and his love for his Lord, Jesus Christ. He never failed to start a conversation or make connection with those around him. Floyd has donated his body to the Mayo Clinic in Rochester, Minn., for use in educational instruction to students in their pursuit of becoming future Mayo Clinic doctors across America. Left to cherish Floyd’s memory are his four daughters and three sons: Carol Hovey of New Hampton, Iowa; Cynthia (Michael) Mawdsley of Algona, Iowa; Cathy Sill of Wabasha, Minn.; Cheryl Sill of Zimmerman, Minn.; Rodney Sill of Wabasha, Minn.; Robert (Jill) Sill of Wabasha, Minn.; and Richard Sill of Cary, N.C.; fourteen grandchildren and six great-grandchildren; brother-in-law Mike Larson and many nieces and nephews. He was preceded in death by his parents, Paul and Ella; wife, Mary; brother, Orville Sill; sister, Ellen Sorenson; sister, Winifred Larson; sister-in-law, Lorraine Sill; brother-in-law Maynard Sorenson; sister-in-law Shirley Bunkofske, brother-in-law Robert Bunkofske and sister-in-law Margaret Bunkofske. Visitation and memorial service will be held at the United Church of Christ, 317 2nd Street W., Wabasha, on Saturday, Feb. 10, 2018. Visitation is from 11:00 a.m. to 1:00 p.m., prior to the service at the church. Memorial Service will start at 1pm. with a church reception following from 2:00 p.m. to 3:00 p.m.. A private burial ceremony will be held at a later date. Memorials may be directed to United Church of Christ, Wabasha, MN.